Deanna Eller-Goodin is the designer behind d. marlene jewelry. Each new collection makes me love her pieces more and more. The gemstones she uses are stunning and all of her pieces have an elegance and an edge to them that make them perfect to wear by themselves or layered with other pieces. I love that you can see the thought and effort Deanna puts into making each and every piece. It's what makes them so special. Not only is Deanna super talented, she's one of the sweetest people I've worked with. I always look forward to her booth at the Scene's Fashion for a Fraction. Here, Deanna shares her background with us and her insight on her jewelry making process. Now I can't wait to see the Sine Cera collection. When did you first start designing jewelry? When did you launch d. marlene jewelry? On my first trip to Monument Valley in Arizona I remember thinking “I should have been a geologist!” I had a rock collection as a child and my love for all things natural continued through to geology class in college. This was my introduction to Mohs scale and testing, formation studies, and actually observing what makes a mineral (stone) beautiful. I’m thankful that now as a jewelry designer I’m actually able to work with what I found intriguing as a child. Many times the stone is what inspires the design. One client said it this way, “You have captured the best representation of the stones and have put them in the best possible light." What a compliment, and a standard that I try to attain with every design. Many times in moments right before falling asleep I find that my mind clears and ideas and images will come. I can see at that moment how metal will connect and how it will “work." I work mostly with sterling silver, but am slowly adding 14 karat gold elements. Aesthetically speaking I used to prefer all silver, but I’ve been enjoying mixed metals and the contrast is really beautiful. And of course I love working with the stones themselves! 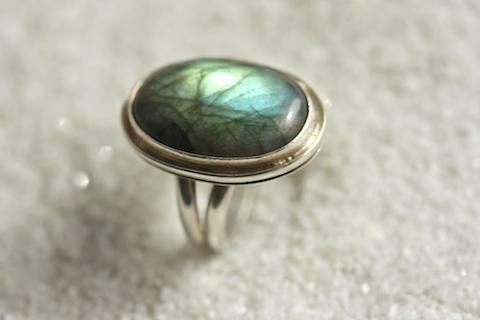 I’ve really fallen in love with the labradorite in our PURE Collection - the aurora borealis effect it displays is quite stunning. I designed a few of the pieces with an open back, to allow the light to heighten this effect. I want all of my pieces to find a good home, but sometimes it’s really quite hard to let them go! Our current PURE Collection is by far my favorite collection! It comes from a place of returning to the basics in the design process as well as emotionally. I was at a point as a designer that I needed to just enjoy the simple tasks of making jewelry...filing, sawing, soldering, etc. and “be in the moment." The Lord really poured through me to create these pieces. One piece in particular is the Luxe Necklace. It has an ancient Phoenician feel that came through in the design process. This is one piece that was created with an open back to let the light really play up the coloring in the stone. I also love the asymmetry of the Simplification Cuff. It’s both edgy and elegant which is very d. marlene. Do you have plans for your next collection? What can we expect to see? The next collection will be our Sine Cera Collection. Sine Cera is Latin meaning “without wax." From it, we derive our English word “sincerity." During the Italian Renaissance many inferior sculptors would use a layer of clear wax to smooth the marble and hide any imperfections and pits of the marble. Fine China manufacturers also used this practice. Only by holding the piece up to the light could one discern any cracks beneath the surface. The light exposed what was really glossed over. When stamped with the phrase “Sine Cera," it meant the piece was “without wax." Sine Cera is valuable in design because it’s about truth and being real. The refinement concept that was started with our PURE Collection is carrying over in our Sine Cera Collection. I’m using Bronzite which is quite beautiful along with Golden Rutile Quartz and Citrine gemstones. I’m excited to introduce spinner rings to the line in mixed metals. Do you make custom pieces for your clients? Yes! I’m happy to consult with clients on bespoke pieces. What current trends do you love? I tend not to follow trends but gravitate more toward timeless, staple pieces with a few unexpected twists in detail thrown in (maybe it’s my dual left/right brained surfacing!) My go-to outfit is a soft washed button down shirt in white or pattern, a soft cardigan in any color, smart denim, fabulous boots and scarf, with an amazing piece of d. marlene jewelry! What other designers or brands do you like? I find the wearable luxury of Ralph Lauren and Chanel inspiring. I love Anthropologie and Banana Republic (their not too preppy pieces). And the interiors at Tori Burch are amazingly dreamy! Fido - When I was 7 I bought a Cocker Spaniel key chain here when it was actually a Pet Shop. Sixth & Pine - Avocado and turkey sandwich with fries and aoili is amazing. Spaghetti Factory - Manager’s favorite with meat sauce and mizithra please! Merridee’s - I know...it’s Franklin, but I couldn’t resist. Hhhhmmm...4 eateries. Does that tell you anything?!?
. She'll keep you updated on all her latest news and promotions.